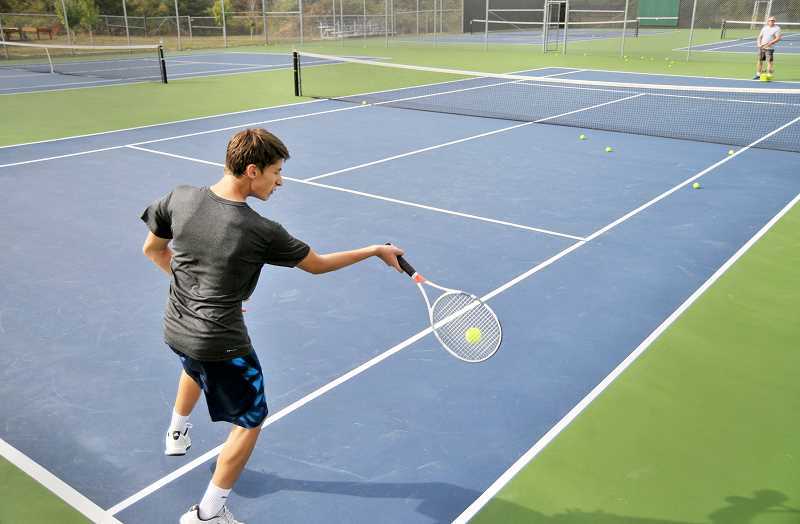 Newberg High boys tennis coach Dave Brown knew the school's courts needed to be resurfaced, but that fact was hammered home even more while playing and leading camps over the summer. Brown himself slipped a couple of times and found several spots on the court that had little to no traction remaining. He saw it as a safety concern that had to be addressed as soon as possible. Athletic director Tim Burke had gotten an estimate to repaint the courts in the last few years, but had been unable to find $22,000 in the budget to do it. But when Brown, assistant coach George Sampson and parent David Frampton assembled a crew to do it themselves at the end of the summer, Burke allocated some funds to make it happen. With the help of about 30 players and parents, Brown and company finished the project in three and a half days just prior to the start of the school year, saving the department approximately $15,000. "There's about 400-plus gallons of fresh paint on those courts," Brown said. "I was planning on playing golf my whole last week of summer. But now it's all done and you feel good about it. I think we've got about $8,000 into it and that includes all the paint for the bleachers, the shed and the special sand for it." After opting to paint the interior areas of the courts blue, as opposed to a lighter shade of green, the complex feels like a new facility. "We've had a ton of positive feedback from the staff because that's how you pull into the school, you see it all when you first come in," Brown said. "It's like the football field. It looks like a million bucks when you pull in." Frampton was key to getting the project done because he had resurfaced tennis courts before and knew the proper procedure for mixing the specialized paint. "You have to mix sand in with conditioners, polymers, water and paint," Brown said. "It's quite a process. The sand definitely gives you that texture to play tennis on. Our courts will slow down quite a bit, which is not a bad thing for most of our kids, and you'll have a lot better foot traction. It will be totally safe out there and they look really good." Brown praised Joel Luft, Annika Selke and Paul Sperling for spearheading the effort among players, although even some former athletes and parents chipped in at various points. "They were the ringleaders of getting everything done," Brown said. "They put in a ton of hours. With all the little things they had to do, they each probably had 40 or 50 hours on that project. They were there the whole time." In addition to providing a lot of the manual labor, Brown also wanted the players to become invested in the facility. "It's good for them because now they're their courts," Brown said. "They're beautiful new courts and they were a part of that. A lot of kids stepped up."